In the early 1800s hair began to be used for the actual making of jewellery. The watch chain was the most popular piece as a lady could be ensured she was in “his” thoughts many times a day, a very romantic notion! But, it could also be worn by those “in mourning”. Hair work jewellery was at the height of its popularity in the 1850s when Victorian women wore jewellery as both a decoration & an outward expression of their innermost feelings. For years it was popular to own a lock of a loved one’s hair, usually in a compartment at the back of a brooch, locket, ring, or even watch fob. Hair work was just as popular as crocheting at the time. They would produce these pieces in their drawing rooms then send it to the jeweller for fittings to be attached. Hair work jewellery took the form of brooches, bracelets, necklaces & chains and there were many different weaves used. The history of this style of jewellery is just amazing and it’s for this reason as well as the rarity of it that makes it so collectible! This type of fabulous jewellery is something that needs to be seen in person to be appreciated. 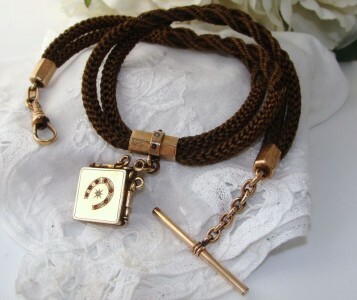 I was going to remove the locket and sell them individually however I just could not manage it. For something so old to be intact and in such amazing condition, I did not want to ruin it. While this presents as a “Hairwork” piece, I believe it has been made from a material to mimic human hair. Many have fallen into such a state of disrepair or destroyed simply for the beautiful locket and clasps they feature. To think this fabulous piece is around 130-150 years old is just amazing and in such Excellent Original condition too. It really was a labour of love to produce such pieces. The main body is comprised of two strands of plaited or knitted work in two different designs. It is adorned with a beautifully hand chased fitting encrusted with faux rubies and a pearl, and has a Rose Gold Hue as do the hexagonal shaped fittings at either end from which the Albert Clasp and T-fob bars are suspended. The extra special part is the locket with its etched horseshoe encrusted with Bohemian Rose Cut Garnets and a Gypsy set diamond at the centre. It houses all the original inserts and is in Fabulous condition. There are no identifying marks for this piece but due its design and styling dates to the 1850s. What an astounding piece of Victoriana! There is little if any wear and no dents, damage, repairs or anything distracting. The weave is held securely in the fittings & there is no fraying. It presents beautifully & would make a wonderful display piece. The photos do not do justice to this and you will be thrilled. These pieces command prices in the hundreds and will only appreciate with time - a fabulous Investment piece! A fabulous Antique treat for you or someone special as a prized addition to any Antique Victorian jewellery or Pocket Watch collection!